KAGETSU was once called the “Suma Kanko House”, the official guest house of Kobe City built in 1938. Modeling after a Swiss cottage, the building was constructed in the half-timbered style with the structuring timbers exposed on the outer wall. It has been selected as one of the 100 greatest architectures in Japan for the impressive architectural techniques and classy taste. The beauty created by the state-of-art technology of early Showa era still lingers inside the building. The frosted glass window, now a very precious antique, and the lobby and restaurant moderately lit by the elegant gas lamps is full of the Westernized style of early Showa. 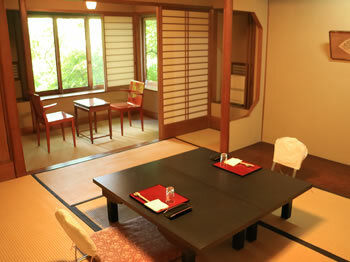 Providing a good contrast, the guestrooms are all traditional Japanese rooms. Indulge yourself in the slow passage of time in the traditional Japanese setting with the old-fashioned dresser, openwork screen, and tokonoma alcove. 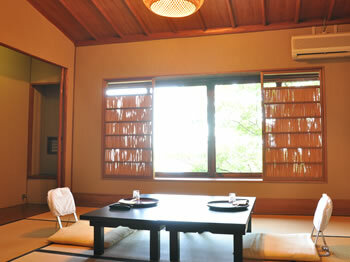 All seven guest rooms at KAGETSU are Japanese rooms. 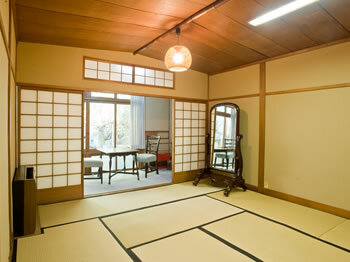 They are traditional rooms covered by the uniquely Japanese flooring material - tatami. You can enjoy the spectacular view of the green-rich mountain and the scenic Suma Kaihin Park from the 90-degree panoramic window. 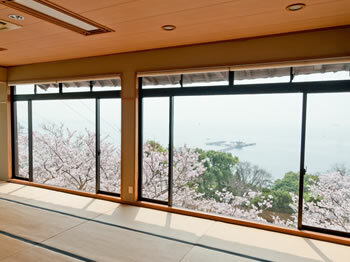 You will be delightfully stunned by the vista from the 39-tatami room with large glass windows. 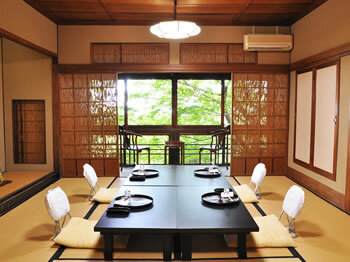 This 8-tatami room has the somewhat nostalgic and cozy ambience. Perfect for a small family or a romantic getaways. This room comes with the sunroom to enjoy the gentle sunlight. The 12-tatami living room is spacious enough for a family trip. 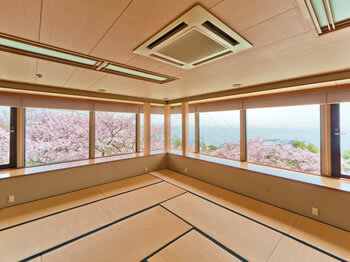 You will be amazed by the early Showa architectural techniques used in this room, such as grilled glass sliding doors and ceiling beams. 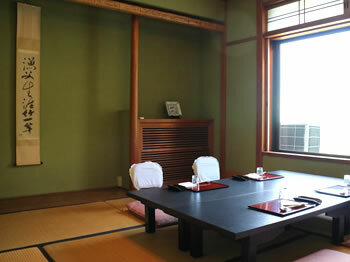 Everything in this room, from the glass door, table and chairs to the dresser, is the genuine antique from early Showa era. As the name indicates, abundance of bamboo, the unique construction material for the Japanese architecture, is used everywhere in this room including the ceiling beams. In case your package has the specific check-out time, it will be honored. *Can be reserved exclusively for your group (for free) between 16:00～20:30 (1 slot = 50 minutes). If you wish to reserve the bath, please make an arrangement when you check in (until 19:30).You can use the baths as public baths (gender-segregated) after 20:30. 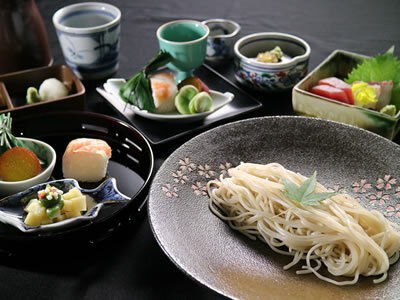 Local vegetables from Tajima, San’in and Awaji Island as well as seafood from the Seto Inland Sea and more. 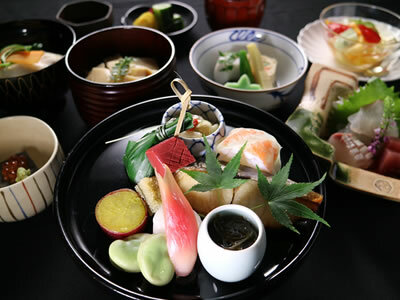 KAGETSU offers the special dining experience with the culinary blessing delivered by the seasonal wind and created by the polished skills and delicate flavoring sense. 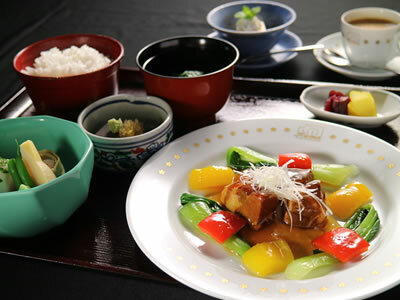 The Japanese word for the culinary art stands for “bringing out the nature’s rules”. In other words, cooking means how we can make the best of the flavors the ingredients originally have. That is why we are committed to using the best ingredients of the season, listening to their voices, and bringing out the very best of their flavors. 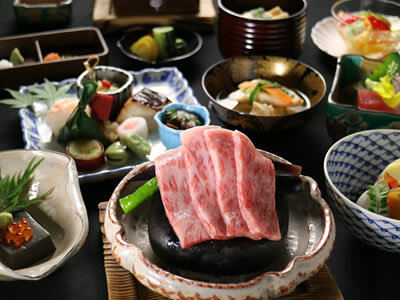 We proudly offer you the pinnacle of the Japanese cuisine that is rich in seasonal touch. 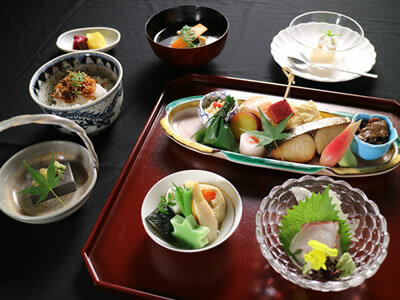 Local vegetables from our hometown of Kobe and Awaji Island, fresh seafood from the Seto Inland Sea, a wide array of fresh produces grown in the rich nature of Tajima and San’in… KAGETSU offers the special dining experience with the culinary blessing delivered by the seasonal wind and created by the polished skills and delicate flavoring sense. 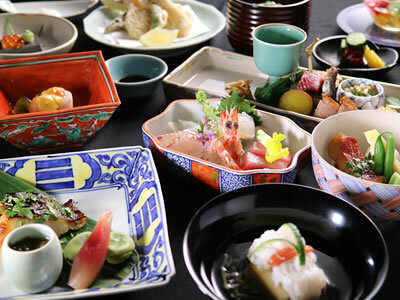 Our specialty is the nouveau Japanese - the fusion of tradition and trend. Our meticulous attention goes not only to the main dishes but also the ingredients that play minor roles. 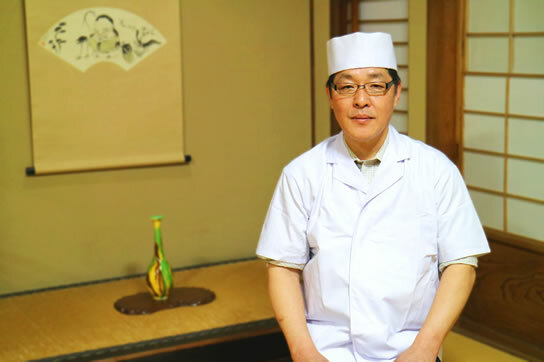 We sincerely hope our commitment to every single item we use and the luxurious experience we offer can tell you what the true essence of Japanese hospitality is all about.